In 1946, after serving in World War II where he was trained on how to fix and clean typewriters, William (Bill) D. Noordyk Sr. started “Noordyk Typewriter Service” from his parent’s basement. Bill drove a service truck from one business to the next providing maintenance, cleanings and repairs to any brand of office typewriter. From this point on Bill Sr. was able to increase his knowledge and experience with not only typewriters, but other office equipment such as adding machines. 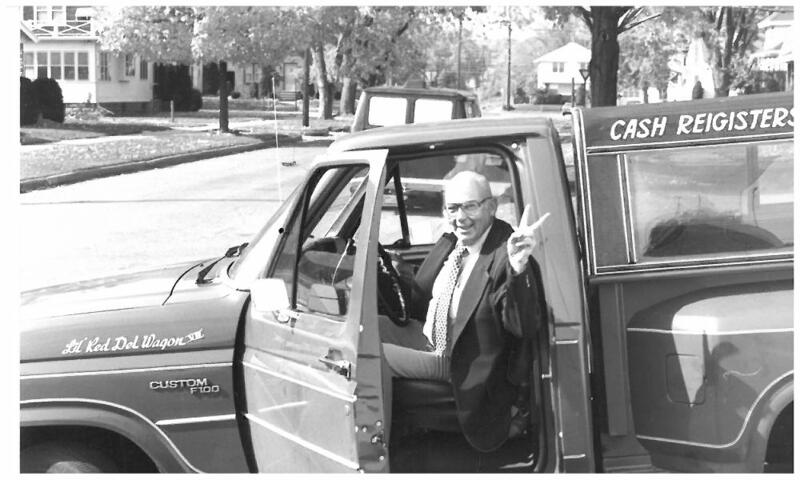 In the 1960s, Bill added a cash register service center, “Noordyk Cash Registers”, to his business. In addition to servicing cash registers, “Noordyk Cash Registers” was a dealer for Anchor Cash Registers throughout the entire state of Michigan. This growth in business required him to hire a small staff and move the business out of his parent’s basement into a home on 1145 Leonard NW, where he shared the storefront home with his father’s business, “Noordyk Insurance”. By 1968, the business was doing so well that they outgrew the shared location with Bill’s father, allowing him to buy a building at 1501 Alpine Ave. With this move, he sold “Noordyk Cash Registers” to another company and grew his staff to 10 employees, broadening his service and sales departments. The industry had transformed tremendously since opening the business in 1946. Bill continued to service all varieties of office equipment, and began buying used office equipment, servicing and fixing it refurbishing for sale. In 1976 William (Bill) A. Noordyk Jr. started as a full time employee at “Noordyk Typewriter Service”. Around this time they began selling new office equipment. Noordyk’s became a dealer for Brother Typewriters, Olivetti Typewriters, Roneo Vickers Mimeographs, and Spirit Duplicators. They were presented an award for selling over 400 Spirit Duplicators in 2 years, putting them in the top 2% in the nation for Spirit Duplicator Dealers. This growth within the business encouraged Bill to rename “Noordyk Typewriter Service” to its current name “Noordyk Business Equipment”. In 1988, Bill Jr. bought “Noordyk Business Equipment” on 1501 Alpine Ave. from his father, Bill Sr. who at that time retired. As technology changed, printers and copiers began to replace mimeographs and duplicators, so Bill took on Sharp, Canon and Kyocera. Continuing changes in the industry provided growth within the business; Bill opened up a secondary location in Muskegon and grew the total staff size to 13 employees, one of whom was responsible for remanufacturing toner cartridges in house. Fax machines became popular and color printers and copiers were introduced. Bill opened a print shop within “Noordyk Business Equipment” at the Alpine location for businesses to outsource their printing. Continued growth found Noordyk’s bursting at the seams and in 2007 Bill moved the business from the Alpine Ave. location into 3606 Remembrance Rd. NW. Our new location supplies a machine showroom, large service center and a warehouse which equips Bill to keep a larger inventory of both used and new office equipment. We have since shifted gears away from buying and selling used equipment to now focusing on selling new equipment, specifically as a Konica Minolta dealer. This change in our business has required additional staff increasing our total staff size to 20 employees. As technology continues to evolve, we are changing with the industry. We now proudly offer OkiData, MBM, and Brother for office equipment and software solutions such as Intellinetics, PaperCut, and PageScope Mobile.